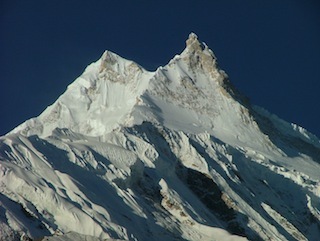 This is a new audio dispatch from Alan Arnette as I climb the 8000m mountain Manaslu in Nepal. Ok, it’s 9/26, I’m getting a little anxious now, WITWIA! Where In The World Is Alan Arnette. Please, someone yell this up into the highest mountains closest to Manaslu and wait to see if you hear Alan yell back. Question: Does a yodel actually bounce off of mountains? Thank you, Jim! We’re all anxious to hear of everyone’s safety & success – especially our good friend, Alan! Seven hours ago Altitude Pakistan reported: SUMMITs on Manaslu! Turkish climber Tunc Findik reportedly made it to the top at 09:30hrs local time. News awaited from rest of the teams. Alan has hopefully summited by now. Thank you, Jim. So, 9/24 USA TIME is the big summit push, I will be sending especially good VIBES to Manaslu summit day. Thank you for that update! Glad all is well. Thanks for the update Cathy. We all hang on every word when he does his fabulous postings, so no worries, we are just excited to read about the adventure. Thanks for keeping us up to date and positive energy to you and Alan both. I was thinking about you Cathy Arnette, and if you have contact with him? Do you worry a lot or accept the fact he is doing fine? There is a broken link somewhere. Sometimes this happens when you are trying to communicate from the middle of nowhere from half-way around the world. I have tried to contact Alan Arnette every way I know to let him know. Please be . “Page not found” for the last couple of postings. Pass the word if anyone hears anything. “Page not found” i cannot read it. Anyone got this problem?